It means picking up McDonald’s and picking through your fries a bit on the way home would be illegal. Drinking your soda would be illegal. Paying too much attention to the radio dial would be illegal. Conversations with a passenger could be considered illegal if it distracts you. The problem is the law is so general in its writing that everything would be illegal. Everything equals distracted driving. While we can admire some of the good intentions of this law, the wanting to protect people, it’s still overreaching. Eating and drinking while driving has been part of the culture for decades. You will not simply regulate this behavior out of existence. Obviously there is a difference between sipping a soda while driving and having the burger in one hand, the fries in the other and using the soda between your knees to steer while your focus changes from entrée to entrée. There are already reckless driving laws on the books to regulate this type of behavior because said behavior will cause obvious instances of reckless driving regardless. The fines associated with this distracted driving law raise a red flag as well. A first offense is $400, with subsequent offenses ranging from $600-$800.00 plus points on your license and even a 90 day suspension. While I do think if you’re a serial offender, you deserve whatever happens to you, this does sort of ring of lawmakers finding revenue in bad behavior. To put this in perspective, the maximum fine for first time reckless driving charge in New Jersey is $200.00 [N.J.S.A. 39:4-96]. You could swerve all over the road and as long as you weren’t holding a cup of Starbucks, your fine would be half [reckless driving can also carry jail time, so don’t test this theory out]. Add to the fact that bad behavior is poorly defined and this law gives carte blanche authority to write tickets all day. Driving with an open container would suddenly apply to Dr. Pepper. Brief update after our article on Pokémon Go causing car wrecks. Apparently the app has added a new safety feature as shown in the below screen shot that notices when a driver is going too fast to use their phone to play the game! Progress! Getting a traffic ticket in Virginia can be a nightmare. If you’re left without guidance you may not know what to do in court, how to go about the entire process. Just because you made a mistake and drove too fast or ran a stop sign doesn’t mean you have to make any more errors that can jeopardize your insurance or cause costly fines. If you’ve just received the ticket, the court may order you to take traffic school to either dismiss the ticket and points entirely or to reduce the fines and fees associated with it. Frankly, you should reach out to the court a week or so after your violation date to find out if you are eligible for traffic school. 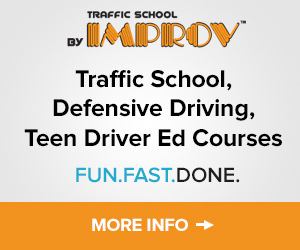 Then you can select the right online Virginia Driver Improvement course [like this one]. Also, in other instances the DMV may order you to complete a traffic school course. This is a bit rarer as usually these are a condition of reinstatement or to avoid suspension. It does happen though. Now, in the event you’ve already paid a fine and received demerit points, Virginia also has what’s known as Safe Driving Points. Safe Driving Points are the counterbalance to demerit points. For every year you drive without an accident, Virginia grants 1 point to anyone holding its state driver’s license. However, you can also get 5 Safe Driving Points at once by completing a Virginia Driver Improvement course! This will restore your points balance to zero or a positive balance and keep your record favorable to insurance providers and even possible employers. On the topic of insurance providers, check with your agent to see if driver improvement course can lower your rates. Many companies accept them for a reduction on your premiums. Every dollar helps! Here’s a pretty big point I’d like to make to you: the courts in Virginia and the DMV have no connection. They don’t talk to each other. Most people give their certificate of completion to the court and think it’s the end of their problems. Nope. You have to make sure your traffic school has also successfully reported your completion to Virginia DMV. You must make sure DMV has your completion on record before you consider all matters closed. Otherwise, you’ll find yourself in a situation where 6 months to a year down the line you’ll still have demerit points on your record. Your premiums will spike and you’ll have to straighten out everything with DMV again to correct your record. Better to do it right the first time. Finally when it comes to selecting a traffic school course, there are some other things you should know: The state requires anyone with a Virginia license to take a traffic school’s course final exam in what’s considered a “testing center”. So basically at the end of the course, you’ll go to a local testing center your school assigns to you based on your location where you will take your final. This is often a library or private mailbox store where your exam attempt will be monitored. It was a fairly common practice in the early to mid 2000s, and while many states have gotten away from this practice, Virginia still requires it. With that in mind, you want to use an online traffic school with a solid, easy to use course that has a strong presence of testing centers in the state. For that reason I recommend I Drive Safely.